Catapush is a reliable push notifications delivery API. Thanks to a standalone push notification gateway, independent of Android FCM/GCM, iOS APN and Windows WNS, Catapush maintains own real time messaging background connection with devices using XMPP protocol thus sending push faster and having the ability to deliver messages under critical situations. Catapush let you send push messages to your customer’s phone, even if the application is closed or during mobile connection dropouts ensuring deliverability of important messages and receipts. If notifications are an important part of your real time app you need to go beyond FCM-GCM /APNS/ WNS “best effort” push delivery! If you already have an application and subscribers who are already using it, you can use Catapush system to enable sending reliable and fast push messages through your app. You can access Catapush notification gateway using our Restful API. Our solution is currently developed for Android, iOS and Windows Phone platforms. In a few hours integrate our iOS, Android, Windows and PhoneGap/Cordova libraries to enable reliable push notifications and in-app messages in your app. Follow the instructions provided by mobile cloud vendors Android FCM/GCM, iOS APNS and Windows WNS. When done we can connect the push notifications you are sending to the subscribers and the application over which they are subscribed. Subscribers who are using your application have to register in order to receive notifications. Integrating our API into your website or backend system adding reliable push functionality is quick and simple. Just copy and paste our fully working code examples for the most widely used languages, such as PHP and ASP.NET, and in a few minutes you'll be ready to use our API to start sending reliable push notifications. Take a look at our REST Quickstart and learn how to quickly build an application that sends push notifications and in-app messages using Catapush REST API. 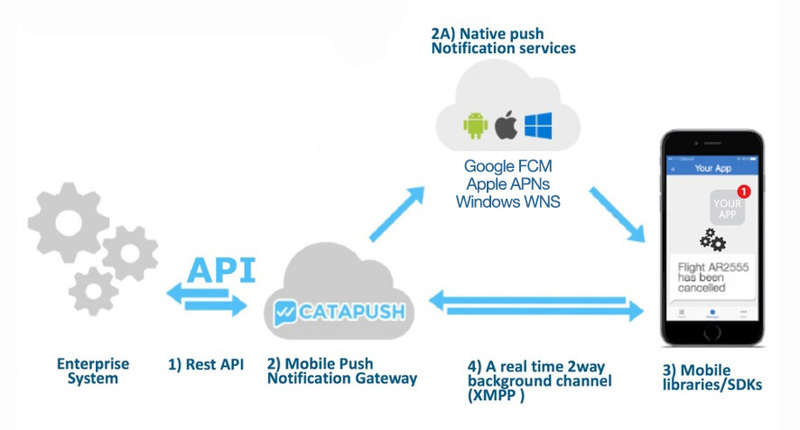 Catapush mobile notification gateway adds critical features to native push capabilities offered by best effort Android, Apple and Windows push services. A background connection with devices using XMPP protocol is always attempted first for superior message delivery and tracking performances, automatic queuing of concurrent messages, single message delivery report status tracking sent all the way back to your service in real time, message expiry time when you want the system to stop retrying to send your push message to an undeliverable recipient and the option to send the message as SMS to reach users for important messages when data connectivity or mobile app is not available. Finally the system enable to receive request or replies to push messages sent (2Way Communication). 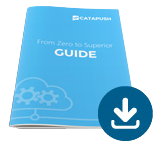 Catapush system is build upon a reliable and secure cloud messaging platform scaling from one to millions of messages without changing a line of code. Zero maintenance windows and a 99,9% uptime. Data transfers encrypted with TLS/SSL 256 Bits all way through your user app.